Customs Agents Check Passengers’ IDs on Domestic Flight at JFKThey were searching for an undocumented immigrant, who wasn’t on the flight. Most Detained at JFK Airport Under Trump’s Travel Ban Have Been ReleasedThe Department of Homeland Security says no one is being held, but reports on the ground indicate that some are still in limbo or have been deported. 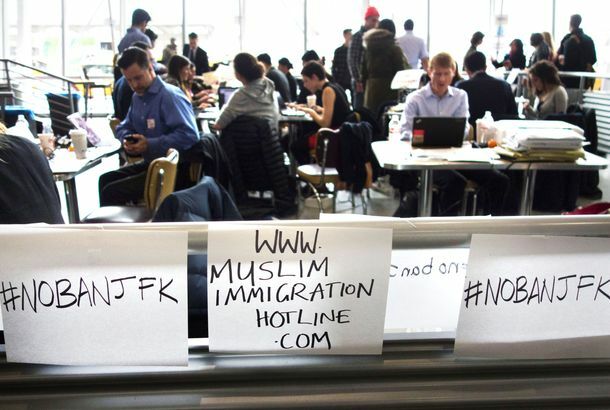 Blackout Strikes JFK Terminal Days After False Alarm Over ShooterWhat else could go wrong? Scenes From the Terrifying, Already Forgotten JFK Airport Shooting That Wasn’tTravelers lived through the panic and chaos of a terror attack, only to learn it was an act of mass crowd hysteria. JFK Airport Evacuated After False Reports of Shots FiredClapping and cheering from people watching the Olympics may have caused the confusion. Bomb Threat Forces American Airlines Passengers to Evacuate at JFK AirportTraveling on the Sunday after Thanksgiving is always stressful, but the people of Flight 67 had an especially tough time. 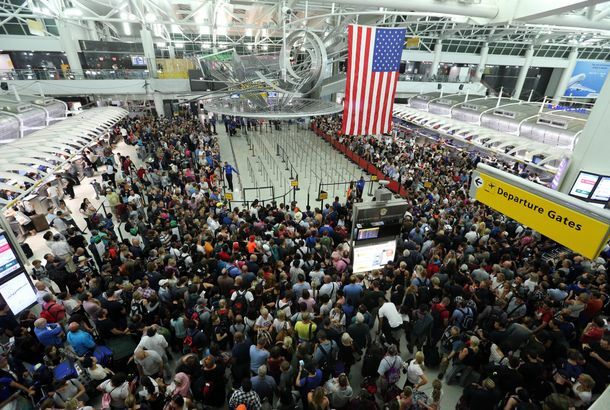 JFK Airport Is Doing Ebola Checks NowPlus: a quarantine in New Jersey and a false alarm in Brooklyn. Creative Smuggler Hid Cocaine in Suitcase HandleHis inventiveness will not go unappreciated. JetBlue Flight Diverted After Dad Loses ItJust in time for Father’s Day. Powdered Custard Packages Not the Best Place to Hide CocaineNo one needs that much non-perishable dessert. Flight Delayed at JFK Over Twitter Bomb ThreatNo explosives were found. Man Makes Unbelievably Lazy Attempt to Smuggle Gun Past JFK SecurityDon’t just put it through the X-ray machine. Uncomfortable Heroin Smuggler Busted at JFK With $70,000 in drugs in his underwear. The Latest Creative But Ultimately Unsuccessful Way to Hide Cocaine: Goat MeatA good effort. Snowy Owls Are Being Shot Dead So You Can Travel Safely This Winter [Updated]The animal kill list at JFK Airport has been updated. A Guy Tried to Board a Flight at JFK With a Bag Full of Dangerous, Sharp Things And a gigantic container of pub pretzel mix. Man Busted at JFK Trying to Smuggle Uranium to Iran in ShoesNot a good plan. FBI Responds to Stinky, Probably Harmless Package at JFK Airport [Updated]It tested positive for weapons-grade chemicals, but those tests are often wrong. The Times Is Not Bullish on the Future of JFK’s WorldportGather ye Instagrams while ye may. Championship Boxer Unaware Guns Are Frowned Upon at the AirportRobert Guerrero was arrested at JFK today for admitting he had one. Drone or UFO (or Something) Spotted Flying Near JFK AirportOnly one pilot saw it. Kimye Skipped Security at JFK, ObviouslyThey were eventually screened privately. Two Women Smuggle Cocaine Into JFK in Their WeavesMore than a kilo each. Plane Flying From New York to Moscow Lands in Iceland After Bomb Threat A fake bomb threat, it seems. Dog on Runway Delays Flight at LaGuardiaWe’re surprised they didn’t shoot it. Man Stopped at JFK With Brass Knuckles, SwordThat’s not all. Apparently You’re Not Supposed to Swim Naked Near JFK’s Fuel DepotOne man found this out the hard way this morning.